The question of whether to move to a Senior Living Community or to stay in your home can lead to a mind numbing barrage of other questions like, what services and amenities are offered or how many different floor plans are available? How much does it cost? Is the food any good? Do you have a pool? Can I bring a pet? Will you take me to my doctors’ appointments? But the most important questions always start with the same two words. What if? What if. What if my house becomes a burden? What if I can’t make it up the stairs anymore? What if my daughter has to relocate for her job? What if my forgetfulness gets worse? What if my spouse passes away? What if I can’t take care of Mom anymore? What if Dad slips on the ice again? What if you could make a positive change for the future? What if you could enjoy life with new friends? What if you could take up a new hobby? What if you could travel without worry? What if you didn’t have to cook, clean or mow the lawn? What if you didn’t have to be the caregiver anymore? What if your kids didn’t have to worry about you anymore? Leaving your home and making the move to an independent living community may seem like you are losing your independence. However, acknowledging your limitations and accepting some assistance now may help you maintain your independence for much, much longer. 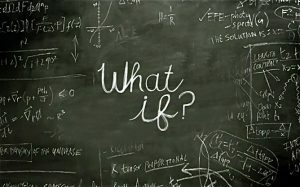 Bridges Senior Lifestyle Living can help answer your What if’s. Let us know how we can help you or your loved one enjoy Better, Happy Retirement Living!